My freezer is way too full right now, you guys. So, the other day I set out to use up some of my frozen goods, and ended up making this Bacon Broccoli Cheddar Crustless Quiche. As it so happened I had broccoli florets (a freezer staple), bacon, AND cheddar in my freezer. 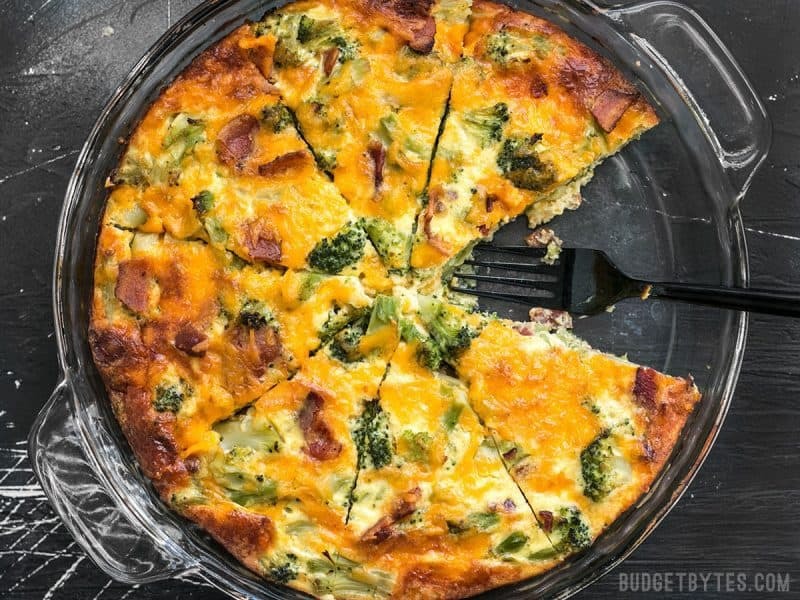 The rest of the very simple ingredients for this Bacon Broccoli Cheddar Crustless Quiche are basic refrigerator staples (eggs, milk, Parmesan), so this is a great last minute breakfast, brunch, or even dinner meal! Yeah, I actually keep bacon in my freezer. For bacon emergencies. No, I’m kidding. Bacon is one of those ingredients that I like to add to recipes in small amounts to add a punch of flavor, so when I buy a package of bacon I slice it right across the strips into three or four chunks (depending on whether it’s a 12oz. or 16oz. package) and then place them into a freezer bag. That way I can grab out a 4oz. piece whenever needed. I add it directly to a skillet frozen and just cook over medium-low heat until the strips thaw enough to separate from each other, then eventually brown and crisp up. Can this be baked in a muffin tin? Yes, egg dishes like this bake very well in muffin tins, although I haven’t tried this particular one so I can’t suggest an exact baking time. The baking time will likely be much shorter (closer to 20-30 minutes), so keep an eye on them and take them out when the tops are puffed and slightly browned. 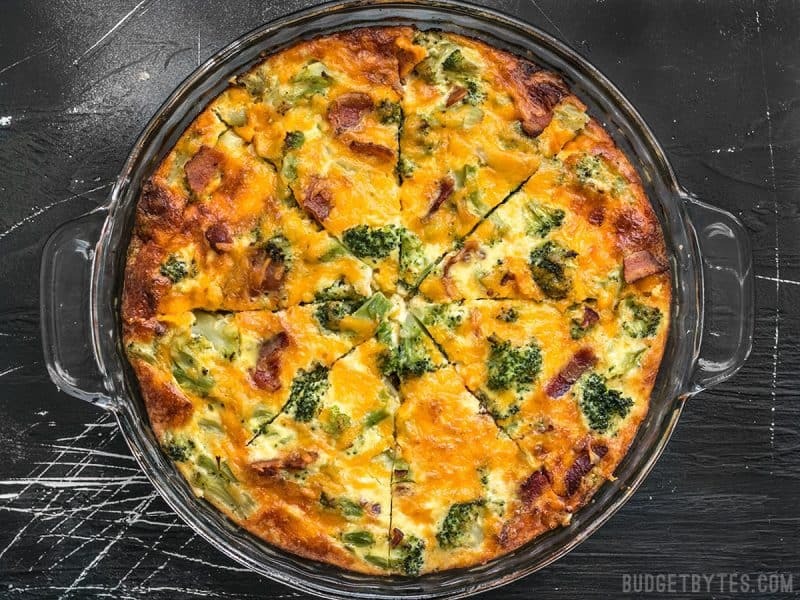 Breakfast, brunch, lunch, or dinner, this Bacon Broccoli Cheddar Crustless Quiche is an easy, filling, and customizable low-carb meal. Take the broccoli florets out of the freezer so they can begin to thaw. Place the bacon in a skillet and cook over medium-low heat until very brown and crispy. 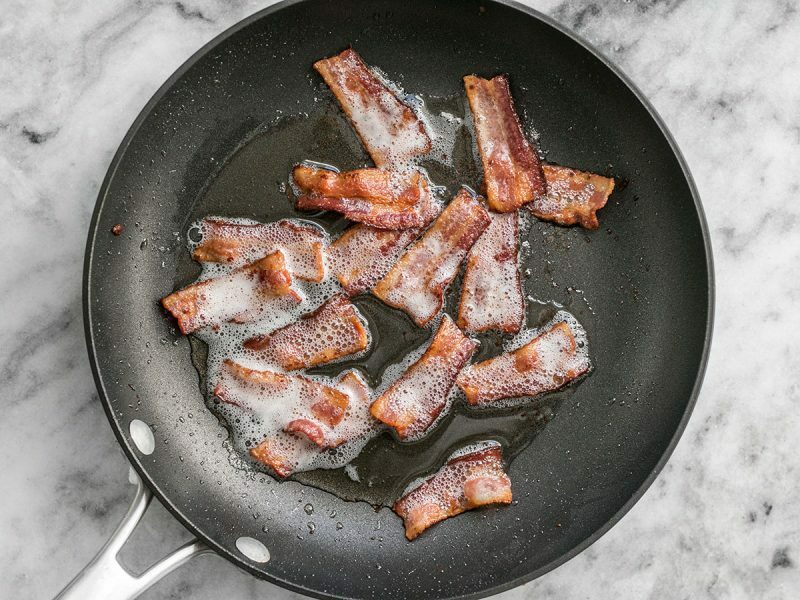 Transfer the bacon to a paper towel lined plate to drain and pour off most of the grease out of the skillet. 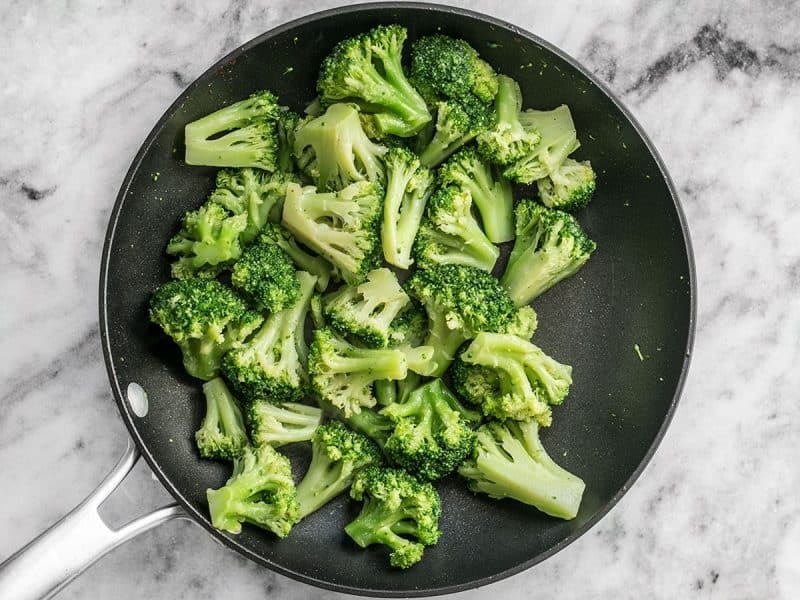 Turn the heat under the skillet up to medium-high and add the broccoli florets. Sauté them in the residual bacon grease until they are no longer frozen. Transfer the broccoli to a cutting board. Roughly chop the florets into smaller, bite-sized pieces. Begin preheating the oven to 350ºF. 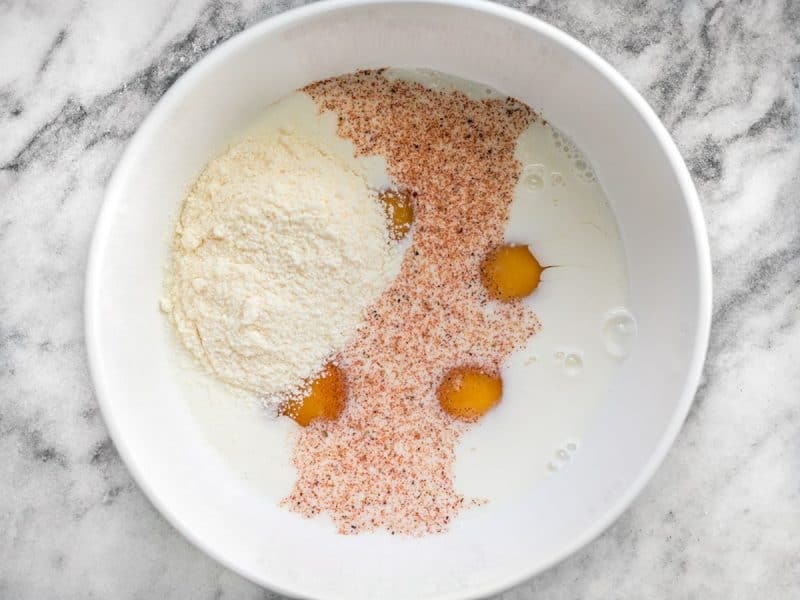 In a medium bowl, whisk together the eggs, milk, Parmesan, and seasoning salt. Coat a 9-inch pie plate in non-stick spray (or butter, if you prefer). 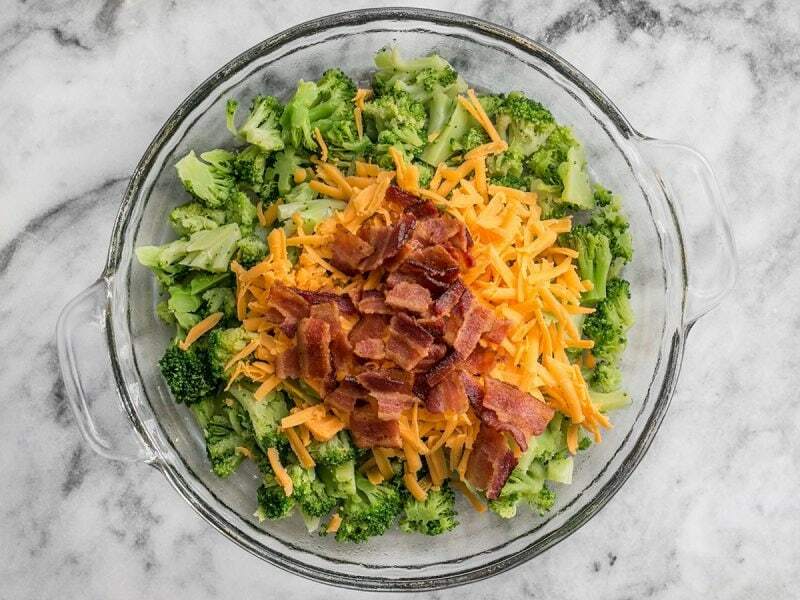 Place the chopped broccoli in the dish along with half of the shredded cheddar. Crumble the bacon over top. 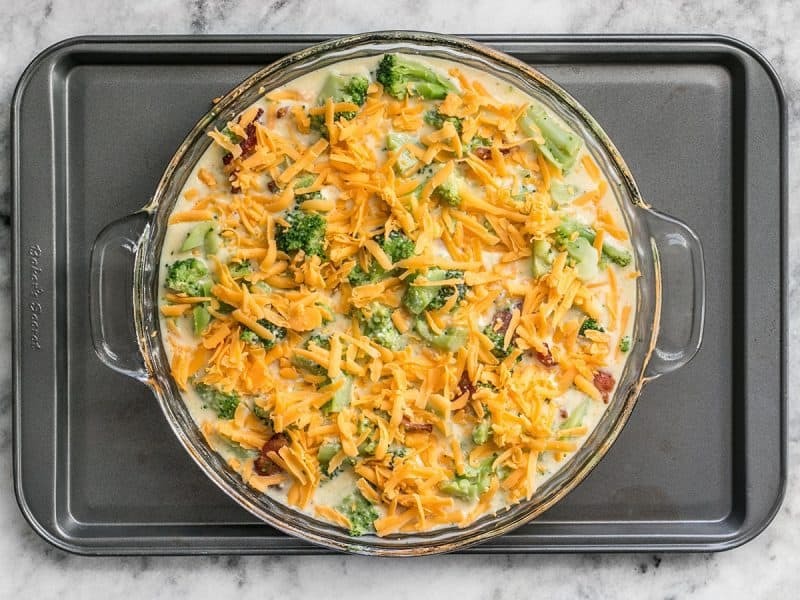 Stir the broccoli, cheddar, and bacon together. Place the pie plate on a baking sheet for easy transport in and out of the oven. 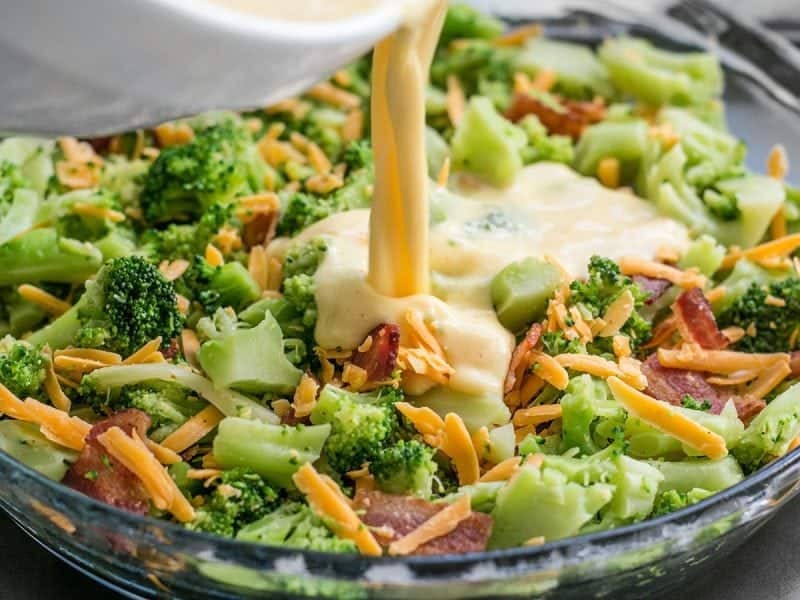 Pour the egg and milk mixture over the bacon, broccoli, and cheddar in the dish. Top with the remaining shredded cheddar. Bake the crustless quiche for 50-55 minutes, or until the center is puffed and it is golden brown around the edges. Let the crustless quiche cool slightly before slicing into eight pieces and serving. Use your favorite seasoning salt, like Lowry's or Tony Chachere's. I used a blend created by my friend's spice company, Avec Tous. Want more crustless quiche? Try my Spinach Mushroom and Feta Crustless Quiche. 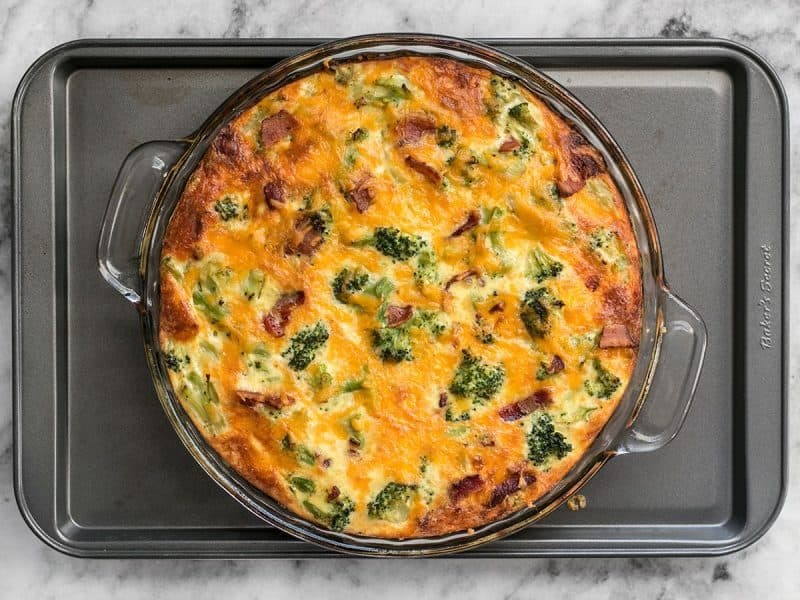 Yes, you can freeze crustless quiche, although they do seep a little water upon thawing and reheating, so if you’re sensitive to this sort of thing freezing might not be a good option for you. 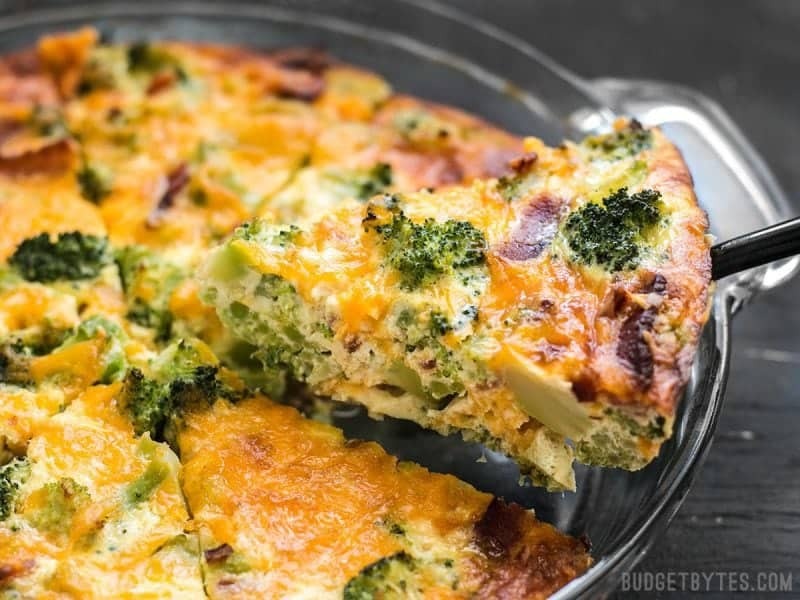 This Bacon Broccoli Cheddar Crustless Quiche will keep in the refrigerator for about four days. Is Crustless Quiche The Same as a Frittata? Nope, the two dishes differ in both texture and cooking technique. Quiche has milk or cream mixed in with the egg, so it has a softer, more delicate, custard-like texture. Frittatas are more solid, like straight baked eggs. Frittatas begin cooking on the stove top and finish with the last few minutes in the oven, whereas quiches are cooked in the oven only. Take one pound of broccoli florets out of the freezer so they can begin to thaw. Place 4oz. bacon in a skillet and cook over medium-low until very brown and crispy (my bacon was frozen and I just placed it in the skillet straight from the freezer without thawing). Transfer the bacon to a paper towel lined plate to drain. Pour off most of the bacon grease, leaving just a bit in the skillet for the broccoli. Turn the heat under the skillet up to medium-high and add the broccoli florets. Sauté the broccoli florets in the leftover bacon fat until they are no longer frozen (just a few minutes, don’t over cook them). This also helps evaporate the excess moisture so your quiche doesn’t end up soupy on the bottom. 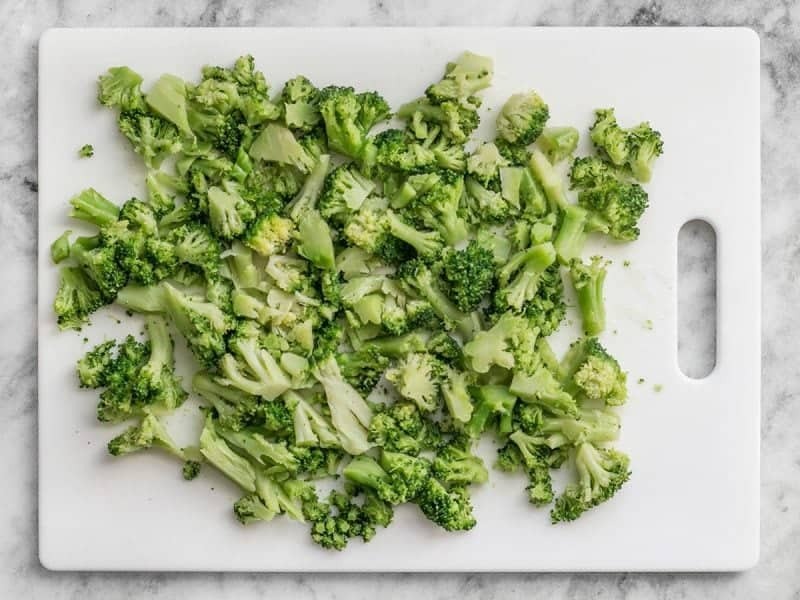 Transfer the broccoli florets to a cutting board and roughly chop them into smaller, bite-sized pieces. Begin preheating the oven to 350ºF. In a medium bowl, whisk together 4 large eggs, 1 cup milk, 1/4 cup grated Parmesan, and about 1/4 tsp seasoning salt. I used Avec Tous seasoning salt, but you could use something like Lowry’s or Tony Chachere’s. Place the chopped broccoli, half of the 4oz. shredded cheddar, and the bacon (crumbled) into a 9-inch pie plate that has been coated with non-stick spray. Stir them together until they’re evenly mixed. Place the pie plate on a baking sheet to make it easier to transport in and out of the oven once it’s full of liquid. 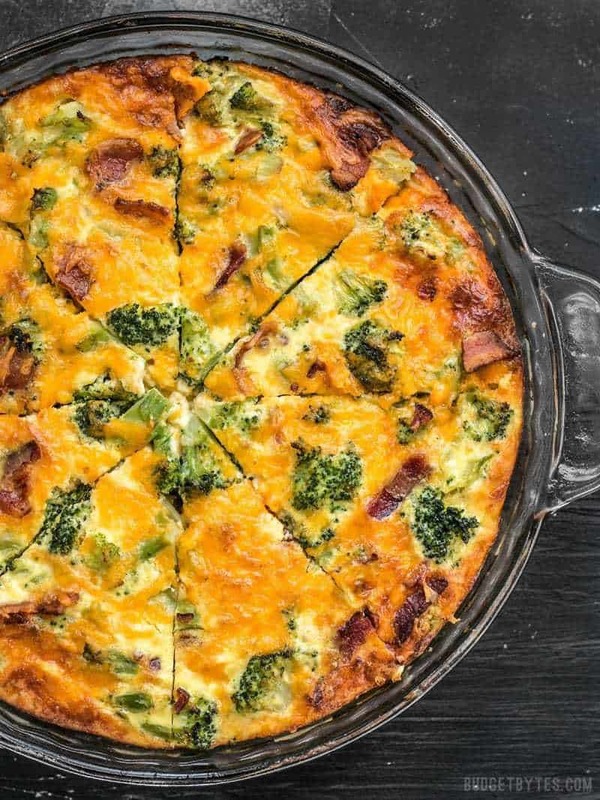 Pour the milk and egg mixture over the bacon, broccoli, and cheddar in the pie plate. Wait about five minutes, then slice it into 8 pieces and serve! i just made this in a muffin pan. i will let you know how it came out.